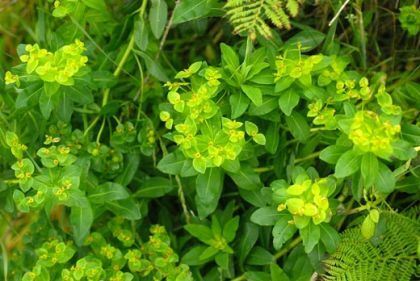 Irish Spurge is not easily confused with other wild plants on this web site. Attractive perennial of the south-west of Ireland, this member of the Euphorbia family grows in clumps along roadsides and in shady woodlands. Its bright yellow-green flowers are without petals or sepals, but are rings of tiny calyx-like bracts around one 3-styled female flower and a ring of 1-anthered male flowers. These flowers are borne on tall stems (to 60cm) and bloom from April to June. The untoothed, oblong leaves are tapering and stalkless. The fruits are 3-lobed capsules covered in little warts. The stem of this native plant, as of others of this species, contains a milky juice or latex. I first identified this plant at Rath in Co Kerry in 1977 and photographed it at Dohilla also in Co Kerry, in 2008. The Latin name Euphorbia was given to the species by Carolus Linnaeus in honour of the Greek physician Euphorbus. 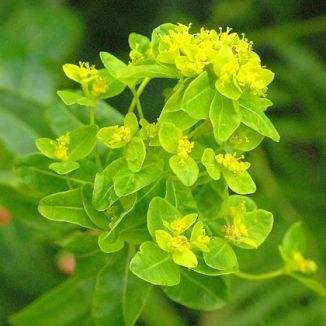 The common name of the spurge comes from the French 'espurge' meaning to purge, as the sap can have this effect if taken internally. Handle Spurges with caution as the sap can also damage skin. Spurges are considered to be poisonous.